Beacon Transport is a truckload carrier company based in Nashville, TN that specializes in hauling non-hazardous dry freight throughout the Southeast, Midwest and Southwest. Our clients include John Deere, Michelin, Carrier Corporation, Frito-Lay, Electrolux Home Products and Bridgestone/Firestone, just to name a few. We have an in-house maintenance staff that handles all of our servicing needs. In order to ensure superior customer satisfaction, we provide each client with a dedicated representative. Furthermore, we assign fleet managers for each of our tractors and drivers. This method allows us to meet client transport expectations. It is the mission of Beacon Transport to develop and maintain a respectable, profitable reputation as a valuable truckload carrier company. In order to achieve this goal, the company has built an office staff that is comprised of dedicated and experienced employees who provide the best customer service and dispatch services available. The company is also committed to hiring qualified drivers that represent Beacon Transport and its customers in a positive manner. By maintaining experienced office personnel, hiring qualified drivers and by providing quality service to customers, it is the desire of Beacon Transport to be a valuable company to both its employees and customers. 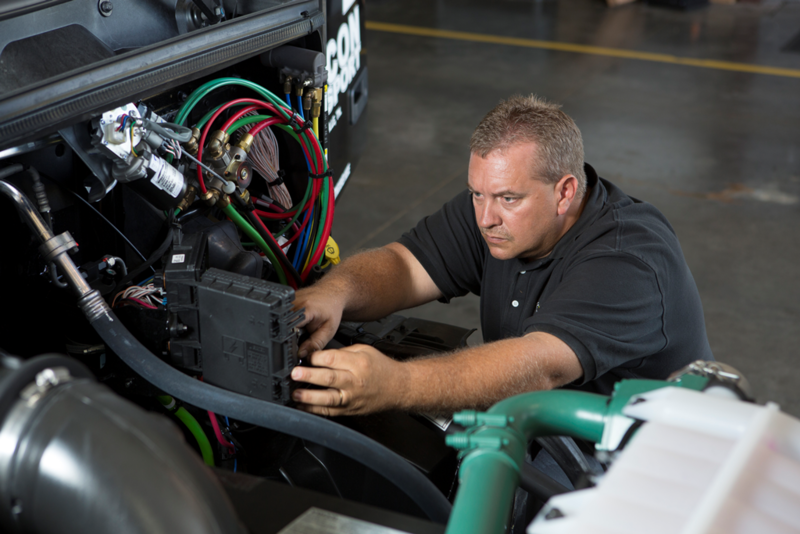 We have an in-house maintenance staff that handles all of our servicing needs. Our world-class equipment includes Volvo 670 Condo tractors that are three years old or newer, as well as five-year-old or newer 53 ft airride Wabash trailers. All of our tractors are equipped with Qualcomm satellite systems, which allows us to be in constant communication with our drivers. Our satellite system also permits us to track the exact location of shipments at any time. Along with our superior equipment and state-of-the-art tracking technology, we run regular service intervals on our tractors and trailers. We have a mandatory safety inspection that all vehicles must pass at our terminal facility. This process ensures that our equipment is reliable with minimal breakdown time. In the event of a breakdown on the road, we have a maintenance supervisor on call 24 hours a day, 7 days a week. Beacon Transport is a respected truckload carrier company committed to providing quality service to our customers and associates alike. SmartWay® is an EPA program that reduces transportation-related emissions by creating incentives to improve supply chain fuel efficiency. Beacon Transport has partnered with the EPA SmartWay® Program in order to continue and to improve our commitment to decrease emissions. We do this by investing in the latest technologies, such as, latest engine technology, electric APU’s, diesel powered APU’s, and diesel fired cab heaters to reduce idle. Beacon Transport, LLC was founded in June 2000 by Stan Pritchett and David Burns. Their goal was to create a successful truckload company by utilizing their years of combined experience in the transportation industry. tan Pritchett began his career in the industry after graduating from UT Martin in June 1986 with an accounting degree. From there, Stan went on to obtain his CPA license. He followed by spending a year at Service Transport in Cookeville, TN before joining the accounting firm Nolan/Sharp & Associates. While at Nolan/Sharp & Associates, Stan gained valuable experience in both transportation and finance, working with several trucking companies in the Middle Tennessee area. Later, Stan joined Humboldt Express and Star Transportation as Controller, where he gained knowledge of the LTL and truckload business. Stan continued his career by joining Southern Shippers, Inc. in April 1995 as the VP of Operations. During his tenure, he managed day-to-day operations, which involved supervision of all office staffers and drivers, management of sales and customer relations, equipment purchasing and financing, driver recruiting and safety, freight rate negotiations and contracts, and insurance rates and claim settlement. avid Burns obtained extensive experience in the direct supervision of sales and account management while working for Service Transport for 18 years. He began his employment with Service Transport in 1982 as a Local Account Representative in Nashville, TN. He became Nashville Sales Manager four years later in the position that he held until becoming Regional Sales Manager in 1987. David was later promoted to National Sales Manager in 1990. In this role, he acted as liaison between the company and more than 100 national accounts, negotiating rates and contracts. David was revered as the top salesperson for Service Transport. Stan and David joined forces in June 2000 founding Beacon Transport, which started its business operations with only five tractors. Since that time, the company has grown to possess more than 150 tractors in its fleet. Beacon Transport serves 48 states with primary emphasis on the Southeast, Midwest and Southwest regions. As a growing company, Beacon Transport provides excellent service to its customers and associates.